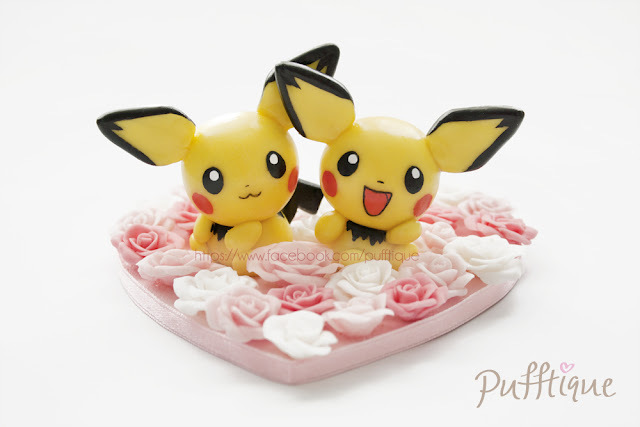 It has been a long time for an update, I made this super adorable Pichu ornament for my friend a few weeks ago. I want to give this ornament a sweet and girly feel, the concept is a garden of pink roses with two Pichus sitting in the middle. I wasn't very confident at first because I don't make figurines often and this would only be my second time making them, it took me a while to figure out how to make and I had to study this character well in order to make it as realistic as possible. Love these cuties! I love these shades of pink roses! So romantic! Here I made two basic shapes, and then add the other features. I painted the features on after the clay hardens after 2-3 days, I am not good with these, the facial expressions took me 3 hours to do. I prepared a large piece of balsa wood for the base, cut into a heart shape and chose a baby pink colour and made the border. I personally think I did a good job with these, it was beyond my expectation within such a short time. I love the colour and the overall composition, it's very girly and pink! It makes me happy by just looking at them. I am very busy with uni these days, but I will keep uploading tutorials and updates on my Facebook page and YouTube channel, make sure you follow them :D! 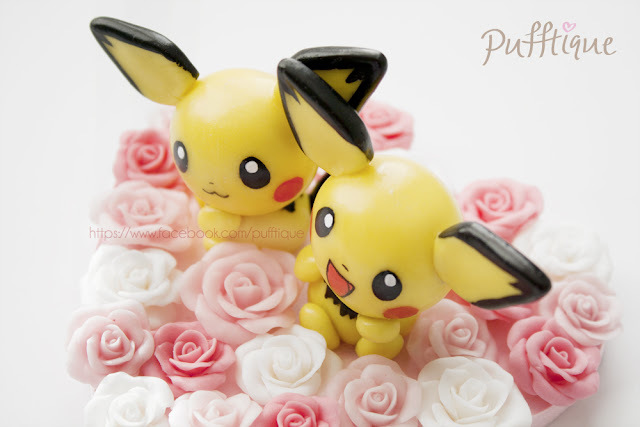 16 comments on "Pichu Love"
Those look gorgeous~ The heart base you did for it also looks amazing. wow!! !very cute! !i like it very much!! This is so cute! 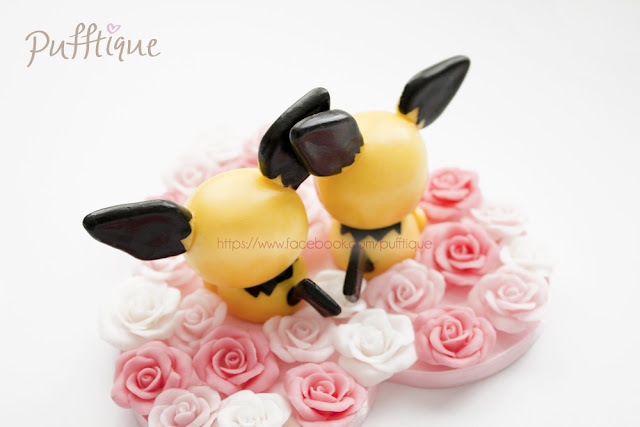 :D By the way, what matte varnish do you use for your Sweets Deco pieces? I live in Australia which isn't far from New Zealand. I've seen the molds you have use for your creations. is it inexpensive if you buy it at sophieandtoffee? Does teh shipping and arrival of your package took a few days or one or two weeks? Hello, my parcel from S&T took around 10 days to arrive, it's a very reliable shop. What kind of clay did you use to make the figures? I use cold porcelain clay. very cute! Can I ask why does it look shiny? did you put something? Hello! I'm Lisa, this is a blog dedicated to my love for cute stuff, food and crafts. I want to share discoveries, techniques, and inspirations of this cute world I am creating. 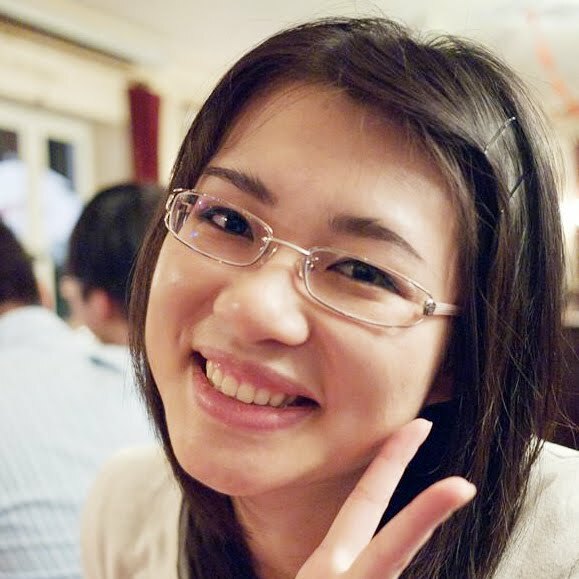 All content of this blog including photos, illustrations and tutorials are copyrighted to Lisa Liao. Contact me before using any images. 2012-2014 Puffy Little Things (C) Lisa Liao, All Rights Reserved. Powered by Blogger.